B.A. 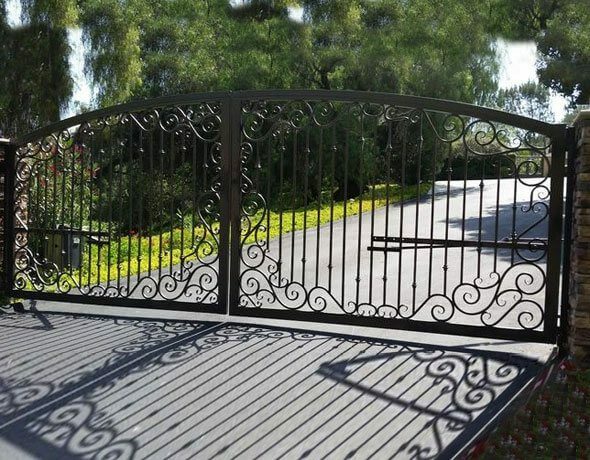 Ramirez & Sons Ornamental Ironworks, Inc. offers those in El Cajon beautiful and functional custom iron gates, fences, railings, doors, and window guards at cost-effective prices. We have served thousands of customers over the last 35 years and have a stellar reputation for providing expertly-crafted, precision-installed ironwork designed to add style and value to El Cajon businesses and homes alike. We serve clients throughout San Diego County, and our diverse client base includes homeowners, gated communities/HOAs, apartment complexes, businesses, industrial complexes, and more. At B.A. Ramirez & Sons Ornamental Ironworks, Inc., providing excellent customer service is extremely important to us. We'll make sure that every piece is done on time, within budget, and to each customer's high expectations. B.A. Ramirez & Sons Ornamental Ironworks, Inc. is licensed, bonded, and insured. Call us today for your all of your iron work needs in El Cajon. B.A. Ramirez & Sons Ornamental Iron Works, Inc. has the skills and expertise to create almost any style of iron fence in El Cajon. This includes wrought iron security fences, perimeter-defining property fences, pool fences, privacy fences, decorative fences, and enclosures, usually with matching manual or automated gates. 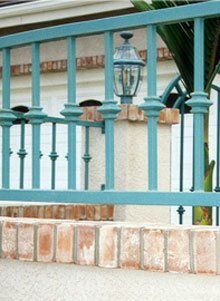 From strictly functional to primarily decorative iron fences, we give El Cajon clients a wide range of choices: you'll be able to choose between tube and solid steel, a range of finial tip options, hundreds of powder coat colors, any fencing style or design (scrolls, pickets, and casted elements), smooth or hammered finish, and more. Moreover, our iron fences are durably built and protected from the elements with galvanized, metallized, or powder coat finish treatments. Because our iron fences and gates are strong, effective, and affordable, we have earned a stellar reputation for value throughout El Cajon and receive most of our business from referrals and repeat customers. In addition to fabricating and installing new iron fences, B.A. 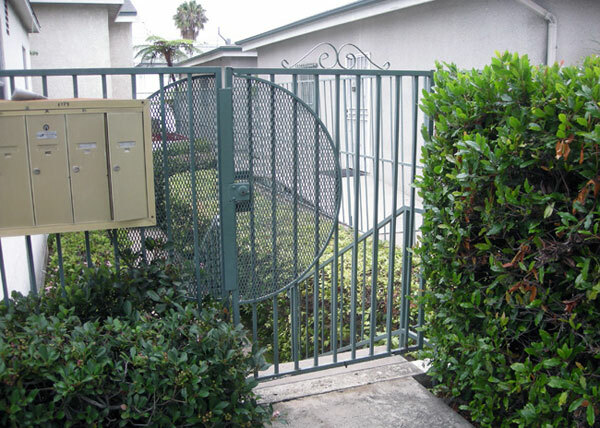 Ramirez & Sons offers iron fence repair and replacement services to El Cajon customers. We work with contractors, property managers, HOAs, and homeowners, and understand their need to get the best return on their investment. As such, we take the time to fully inspect each fence before recommending options to suit their goals and budget. All of our iron fence installations, repairs, and replacements in El Cajon meet with the highest of standards and are designed to enhance properties for years to come. Call us today and learn about our comprehensive iron fencing services for El Cajon. 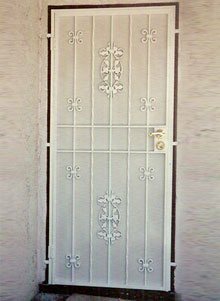 Whether you would like a simple iron entry gate, a beautifully-designed wrought iron entry gate, or a stylish but effective iron security gate, B.A. 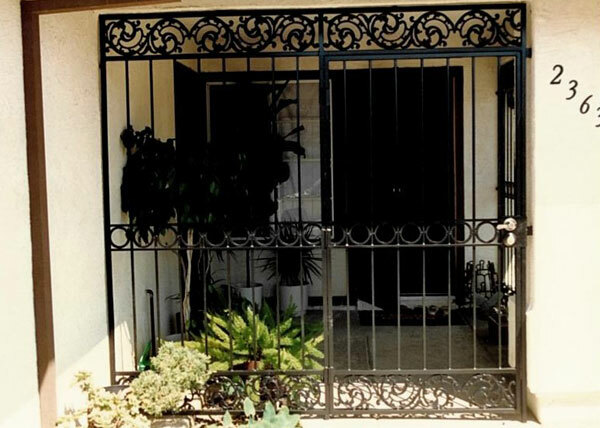 Ramirez & Sons Ornamental Iron Works, Inc. can design and custom-build the perfect iron gate for your El Cajon home or business. With our ability to replicate or create any design, we can help you get a gate that meets all of your functional needs and aesthetic preferences. In addition to customizing the look of your gate, you'll be able to have your gate motorized and/or controlled by a state-of-the-art access control system. Contact us today to learn more about our iron entry, security, and access gates for El Cajon customers. When you are looking to install an motorized entryway or driveway gate in El Cajon, make sure you call B.A. Ramirez & Sons. Installing, replacing, and repairing motorized (or automatic) gates is where our expertise truly shines. 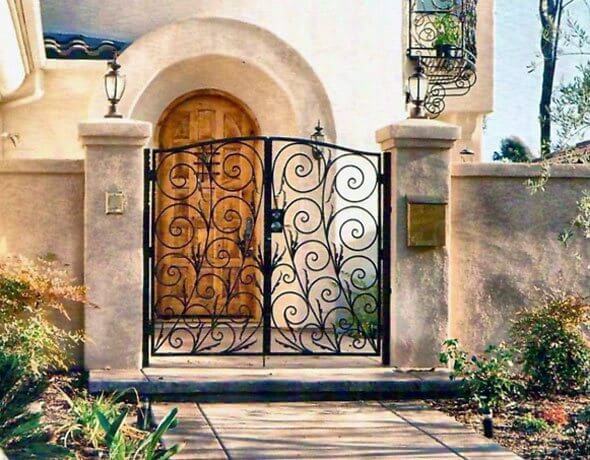 Not only do we have the capacity to realize any iron gate design using masterful iron hand-forging and welding techniques, but we can also have it function exactly as you wish. We can install any of the automatic gate openers made by LiftMaster, DoorKing, Elite, All-O-Matic, Linear, RamSet, and other leading brands, and make it possible for gates to swing or slide open reliably, safely, and conveniently. Best of all, when installed properly, they're also backed by substantial manufacturer warranties. 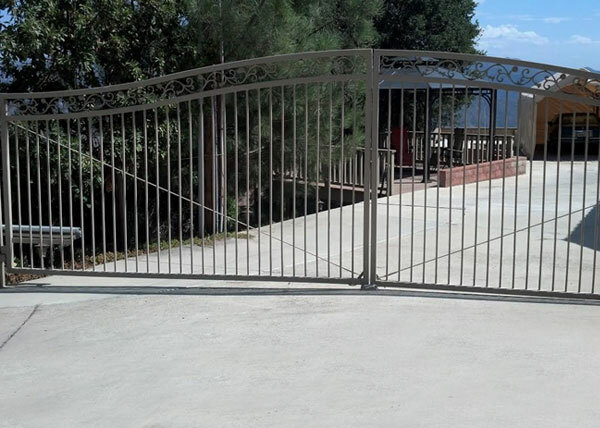 Contact us today for a free motorized gate consultation and online estimate in El Cajon. B.A. 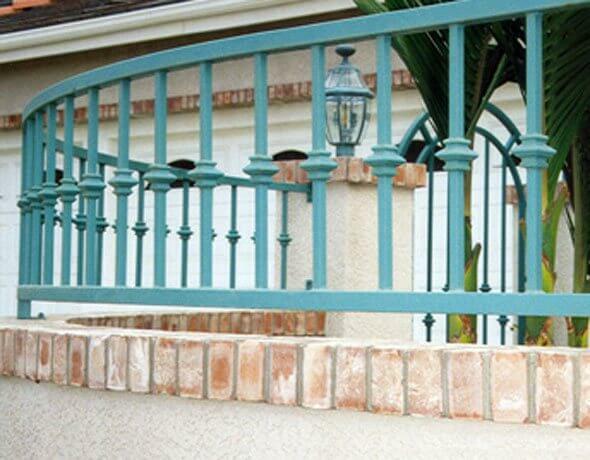 Ramirez & Sons Ornamental Iron Work, Inc. custom-designs all types of El Cajon residential and commercial iron railings, including handrails, guardrails, and railings for balconies and staircases. Our prices are competitive and we tailor each of our iron rails to perfectly suit our El Cajon customer's functional needs, property, and budget. We can fit rounded, spiral, circular, and wraparound stairways, offer design options ranging from the simple to highly ornate, and work within a specified budget. Additional railing customizations can include crown caps, decorative picket-type balusters (with baskets, collars, knuckles, and knobs), and scrollwork that flows throughout the railing in place of pickets. We can even replace wood balusters with iron and leave the original wood top rail. 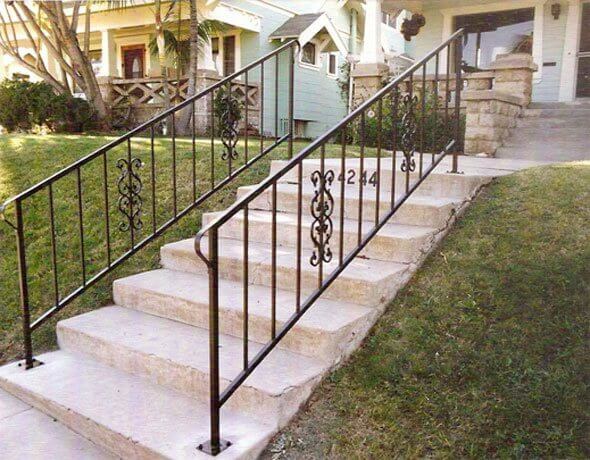 Our iron railings are compliant with current building codes and ADA standards. 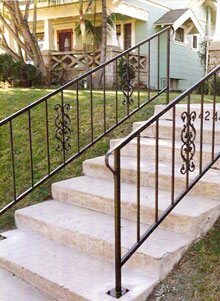 Call us today to install a quality iron handrail at your El Cajon home or business; we're happy to work off of photos, go over our previous jobs, or discuss your ideas for an interior or exterior iron railing at your El Cajon property. The ironwork specialists at B.A. 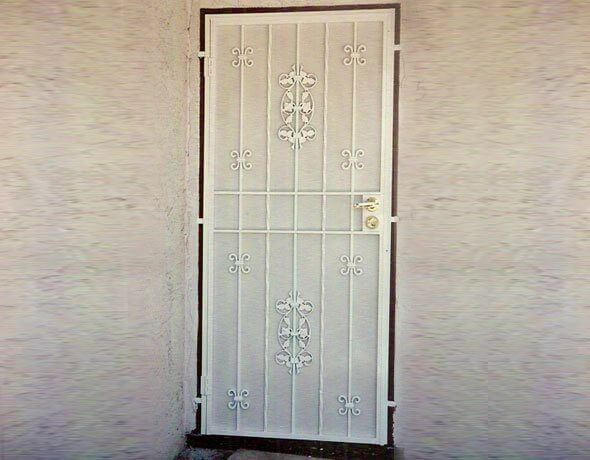 Ramirez & Sons Ornamental Iron Works, Inc., can custom-design, build, and install high-quality iron window bars/guards or screen doors for your El Cajon home or business at a great price. We customize all our window guards and doors to each client's exact specifications, and are capable of creating or replicating any design of your choosing. Our iron window guards for El Cajon are automatically built with code-approved fire releases and can feature tubular or solid iron bars, straight bars, hammered scrolls (with or without heart or fleur de lis designs), balusters with decorative points, and more. Additionally, we can install our iron screen doors for your existing El Cajon door opening or fabricate a decorative enclosure that will keep visitors away from your door. These iron entry doors can be customized with intercoms or keypad access systems. Contact us today for a free onsite consultation and online estimate. Commercial customers rely on B.A. Ramirez & Sons Ornamental Iron Works, Inc. for all of their iron gate, railing, door, window guard, and fencing needs in El Cajon. That's because we have three decades of experience creating custom-designed ironwork and offer competitive prices, excellent warranties, and personalized service. We tailor each fence, gate, railing, security door, and window guard to our clients' unique vision, needs, and budgets. Over the years, we have been trusted to install spear-topped iron fences that deter trespassers; handicap railings that comply with ADA codes; fencing and driveway gates that enhance privacy; automated main entry gates with intercoms, card readers, and other automated controls; custom-design wine cellar gates with flowing, hand-forged scrolls and decorative iron castings; and much more. Call B.A. Ramirez & Sons Ornamental Iron Works, Inc. today and we'll be happy to help you with your El Cajon commercial ironwork needs. Design consultations and online estimates are provided free of charge. 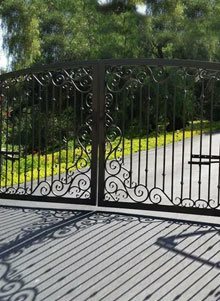 El Cajon homeowners prefer us for ironwork because we provide one of the best values in custom-designed residential fences, gates, railings, screen doors, and window bars. Our team consists of highly skilled and dedicated craftsmen who are able to fully meet a wide range of privacy, security, and safety needs while also adding value and beauty to your El Cajon home. Our iron fences, railings, gates, doors, and window bars are made with lasting, premium quality steel and the best practices for hand-forging and welding iron. We can make iron structures that feature sweeping scroll work or smooth, twisted, or hammered pickets; casted iron decorative touches; and anti-corrosion coatings. Further, by offering fair prices, honest business practices, and timely service, we have been trusted to work on thousands of residential projects throughout El Cajon and the greater San Diego County area and have maintained a stellar reputation. Call today. D8 At the entrance of this family's home in El Cajon, CA, B.A. Ramirez & Sons installed a steel security gate. 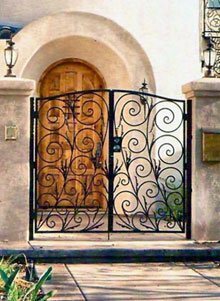 Ornate pontalba casting designs give the gate a beautiful European look and its sturdy steel tube frame keeps individuals a safe distance from the front door. G36 This commercial style access gate is at the entrance to a apartment complex in El Cajon CA. Expanded metal screen protects the lock area from vandalism. The gate is made using 1.5" steel tube for the posts and frame with &frac58;" pickets spaced 4" apart. DW10 This arched automated gate in El Cajon, CA features a steel tube frame and verticals with aluminum casting designs. It operates on 24 volts and can be opened and closed with the click of a transmitter.